Frequently we get enquiries from customers wanting one–way vision on glass between two internal rooms. An example is where people in an interview room are to be observed without them being aware. 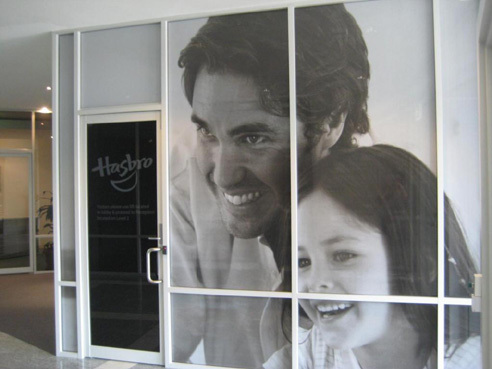 One way vision solutions from Paragon Window Tinting & Graphics are designed to allow vision through from one direction while providing an obscured appearance from the opposite side. One Way vision solutions can be used in any situation that requires undetected observation for study or surveillance such as reception areas‚ internal offices‚ interview rooms‚ prisons‚ gambling casinos and psychiatric treatment centers. To achieve this one–way‚ lighting in the room being observed (Room A) needs to be significantly higher than that in the room where the observers are located (‘Viewing Room’ or Room B). The ideal lighting ratio is 7:1 – that is – 7 times brighter in the room being observed (A) than in the viewing Room (B). Where this 7:1 ratio of lighting is possible‚ a number of different films can be chosen such as a digitally printed perforated film or a Silver Reflective Film. This is placed on the Observed Room side (A) side of the glass panel and will give an obscured effect in Room A‚ allowing through vision only from Room B. A floodlight in the Observed Room (A) to shine down onto the silver film. PLEASE NOTE: If there are external windows in either of these rooms it can be difficult to obtain a one–way effect without completely blocking the light with either block–out film or curtains.